US Pat # 8,083,483 This is a reinvention of the water wheel. Initially it could be immediately produced and utilized in arid countries to elevate water for irrigation and pressure for reverse osmosis for purification of water. At the same time as above permits could be started for utilization of this unique and effective energy conversion device here in this country.. If utilized, this could surpass wind in energy conversion. In addition to the above, I have u.s. pat. 7,607,862 Shoaling Water Energy Conversion Device, which with the water wheel device offer a corporation "carbon credits" while in process of development. Desire reasonable outright sale or other graduated means of transfer. 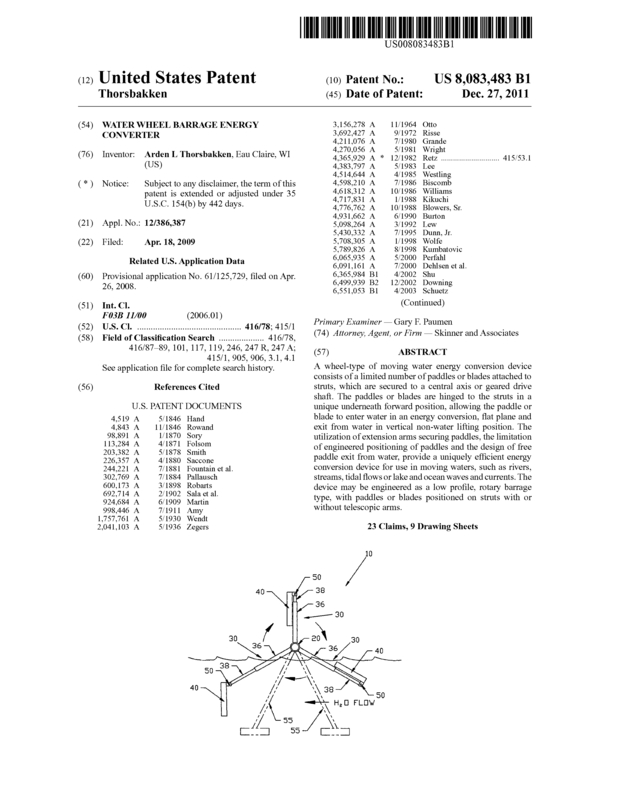 Page created at 2019-04-26 18:27:21, Patent Auction Time.